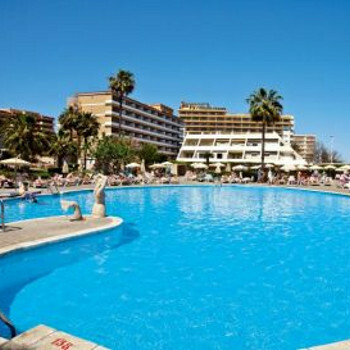 I would highly recommend this hotel to anyone who is thinking of going to Torremolinos. The food, location, staff and the rooms are of a very high standard. The marina is only a few minutes walk to the right, there are loads of good quality places to eat and drink or just to watch the world pass by. My only gripe.... you can choose to eat outside, which we did but we were sandwiched between smokers who insisted on smoking between courses, you keep the same table for the duration of your stay, so the smoking became a real bind. Absolutely excellent Hotel. Location is great - on outskirts of Torremolinos and near Benalmadena harbour with beach immediately to the rear of Hotel. Room comfortable and Hotel spotlessly clean. Staff helpful and food absolutely fantastic - massive choice each day for breakfast and evening meal - many dishes cooked fresh in front of you. The manager was everywhere and constantly engaging with guests and the staff were helpful and friendly. Pool area was good - usual reserving of beds/sun shades first thing in morning but enough to go round. Waiter service around pool throughout the day. Prices reflect 3.30 Euro for a 400ml beer and 2 Euro for a coke and circa 6/7 Euro for Cocktails. Entertainment most nights occasionally out on the terrace - not stunning but certainly acceptable. The marks in the Thompson brochure from previous visitors - all in the 90% - totally justified. If you are thinking of going here you will not be disappointed. Exit the Hotel at the rear, turn left and try the first beach bar on the right for lunch - delicious whitebait/quid/prawns and 3 Euro for a half litre of beer. Numerous excursions on offer albeit we choose to stay put and chill for the duration of our stay. We stayed here from 7th-12th March. Hotel itself is very good with food choice good, rooms very clean, staff very friendly. When we where down at dinner on first night we had money stolen from our suitcase which was in wardrobe with a padlock on it.We did not discover this until next morning. The Director of the hotel wasn't very helpful. Stated this hadn't happened before. So just be sure you take a safe deposit box. Stayed at this hotel for 5 days January 2007, brilliant hotel rooms were very spacious had balcony overlooking pool area. We went half board basis and were not dissapointed the food was excellent cooked fresh some of it ion front of you nothing was too much trouble staff were very friendly and couldn't do enough for you. The riu is in a nice location right on the beach front 2 mins to Benelmadena and 2 mins to torremolinos along the sea front there is a gate leading onto the beach that is open till 8pm daily. Plenty of sunbeds around the pool, bar and cafe area open whilst anyone around pool. We will be staying here again no doubt one of the best hotels we have stayed in. Having stayed previously at the Rui Bel Playa & Rui Porto Marina I was expecting the usual excellent standard however I am pleased to say that this hotel surpassed by expectations. I can say that I have never experienced such good food at any of the many good hotels that we have stayed at on a half board basis. This hotel was run very efficiently under the supervision of the Director/Manager Manwell and customer service was second to none. I would agree with previous comments that this hotel attracts a more mature guest however even though myself and my husband are only in our thirties we were not put off by this as there are plenty of attractions outside of the hotel. My daughter is eleven years old and she too enjoyed her stay very much. I cannot comment on the entertainment as we went outside of the hotel in the evenings. The location of this hotel is very good as you get the best of both worlds as you can easily walk to both Benalmadena & Torremolinos. Enjoy! Returned from the Nautilus Thursday 14th September 2006. Travelled with my husband and two friends. We are all middle aged. First time ever have arrived at hotel to be told our rooms are not ready! Not a problem we were told to return in an hour and they would be ready and they were. Rooms are very nice, clean and quite spacious,there is air con and as a bonus a ceiling fan. The view (well couldn't call it that) was a bit poor, overlooking a hedge but as we were on the second floor we didn't have to worry about steps or lifts, so we didn't complain. We expected to be greeted by the rep and perhaps a welcome drink, but didn't see the rep all the 10 days ! No trips, no help ! It appears that she is at the hotel next door sometimes, but no-one told us !!. As frequent visitors to Spain it didn't spoil our holiday. Most of the staff in the hotel very friendly, the maids do a fab job. Most of the bar staff friendly. I think that there is a bias towards German guests but "whatever" Food lovely, no complaints there, don't however, like the 2 sittings arrangement in the evening, it takes away the freedom of choice to dine when you are ready. The dining room is a bit cramped. The location of the hotel couldn't be better, everything on hand and lovely walks in the evening across the prom. Good job because the entertainment was uninspiring. The pool was nice but my husband suffered a nasty ear infection and needed medical attention (which was available in the hotel Brill idea). Beware, I would wear ear plugs. We all agreed that we would visit the hotel again despite that we felt a bit invisable at times. The Hotel was very clean including the pool and gardens. The food was good with a very wide choice for breakfast and dinner. We found the staff very friendly especially to the children. I cannot praise this hotel enough, Excellant from start to finish, we stayed over Christmas and had a fantasic time. Weather was a little ropey, very windy but you can't blame hotel for that. The hotel staff were excellent and I would disagree the 'Brits' are treated diferently to the Germans. The staff were very helpful and food was superb. My son was ill (he is 6yrs) on Boxing day and staff were very attentive and very helpful throughout the day, they called our room to check he was ok and even brought some pasta, bread and bananas to our room for him. Overall brillant stay and will definitley go back, infact can't wait to go back. Excellent hotel would recommend it to any one. Entertainment was ok, if you like ballroom dancing and that kinda thing but over the road was some excellent bars with very cheap drink! As I said will definitley book and go again ! The hotel is situated right next to the beach which is not the best beach I have seen. The room allocated to us is in a section numbered 18-51 and had a very high wall no more than 2 metres from the balcony and this meant no view whatsoever. We asked to be moved and were promised by the reception that we could. We spoke to the rep (on a rare Visit) who said that everyone who is allocated this section asks to be moved. Despite a few enquiries we were never moved. The meals were very repetitive although adequate. Six members of our family met at the hotel and we asked in the dining room if we could sit together and were refused although German parties of six were allowed to. Cannot fault the hotel cleanlinness, it was spotless. At the end of out holiday we asked if we keep our room until about 6.0pm as we had a late flight. Not allowed. On our day of departure we asked if we could use a courtesy room for a shower and agreed a time of 6.0pm with reception for this only to be told when we went to reception at 5.50pm to get the key we were too late. Words had to be exchanged before they relented. The problem we had with this hotel was an apparent bias against British guests by the management and this spoilt our holiday. The rep agreed about the bias. We have stayed at the Nautilus several times and enjoy the location, cleanliness and the quality of the food. I would concur with other comments regarding the bias towards the German holidaymaker and on the holiday we have just returned from we unfortunately didn't have a room with a very good view. The hotel is ideal for those wanting a relaxing holiday with a good standard of accommodation. Those looking for entertainment, activities and nightlife may want to choose something else. The hotel was most accommodating towards our 1 year old and there is a small paddling pool for children. The reason we used this hotel previously was because it wasn't appealing to families. Gone are the days of our "couples" holidays but we'll still return to the Nautilus for at least one week each year. Another point that some readers may be interested in is that the room on the lower floors can be plagued with cats lying on the balcony. Which is okay I suppose if you like them! !